Thunderstorm was released by Demeter a few years back. It is an extraordinarily evocative scent, almost uncanny in its ability to call up a thunderstorm in early spring: the electricity, the humidity hanging heavy in the air, the almost-metallic rush of ozone. The really fun part — the part that actually smells like a storm — doesn't last long, but while it does, it is eerie enough that you could probably cause a small child to have a nightmare by spraying it in their room as they were sleeping. The dry down is the smell that is left after the storm, largely wet leaves and water-soaked earth, and something vaguely chalky that almost mimics the smell of rain drying on hot pavement. After an hour or so it smells mostly of dirt and roots. The lasting power is reasonable if not quite spectacular. 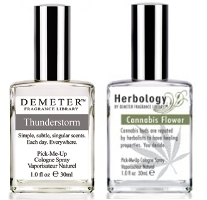 Demeter also makes a Rain fragrance, and they describe it as "cleaner and more delicate"; I assume it is similar to the dry down of Thunderstorm but please comment if you've tried both. Cannabis Flower joined the Herbology Collection this year, along with Green Tea, Ginseng and Ginger. Demeter describes the fragrance as "the shredded flowers of Cannabis Sativa, the hemp plant", and admittedly, I've never smelled the shredded flowers, but if you're looking for the smell of marijuana you won't find it here. Ok, there is the teensiest little suggestion in the dry down, but I asked an entirely random sample of innocent bystanders to guess what it was, and none of them did. This is a greenish floral, mildly sweet, and very pleasant if not what I expected. Fragrance names that caught my eye while browsing at Demeter: Coriander Tea, Holy Smoke, Lobster, Mesquite, Pruning Shears. Please comment if you've tried any of them, or the recently released Demeter Play-doh, or if you have another favorite from Demeter. I have only barely scraped the surface. Thanks S, I was intrigued by that one because they say they've also got the smell of the pruning shears themselves — something metallic. Will have to get my hands on a sample! Seconding Marina — think you would HATE mesquite. Their Russian Leather isn't bad, and it's cheap, but nothing to rave about. Thunderstorm is my favorite. The first time I smelled it, all the hairs on my head stood up. FWIW Christopher Brosius has his own versions of most of these scents in his store, but unfortunately I don't believe he sells samples. They were amazing to smell, though. I told you about the Demeter quality control issues… the CB stuff certainly smells more expensive, and (if you get the oils) they last longer. M, yes, actually the dry down of Thunderstorm made me think of CB's Black March. And the water versions from CB last pretty well too, I think, although haven't timed them next to the oils. I have Holy Smoke and to my nose it smells EXACTLY like the incense they burn in Catholic churches. In fact, if you've ever been to Catholic church you'd say it smells more like “church” than like “incense”. I'm very intrigued by Mesquite! It's a popular wood down here and pretty much all of central TX smells like mesquite all summer long. I'm afraid that if I wore it I'd crave barbecue constantly, though! Catholic church incense sounds perfect. Now I'm dying to know if you've ever tried Comme des Garcons Avignon, and how it compares to Holy Smoke? I'd agree with M – it's very smokey, but to my nose it's really quite sweetly smokey. It rather smells a little like Tim's Barbeque Chips taste. Not something I can see very many folks wearing, honestly. But I dare say, it is pretty interesting. I was all ready to purchase Play Doh the minute I saw it on the shelf, but it really didn't smell anything like the real stuff to my nose. Too sweet, IIRC. My favorite Demeters so far have been Gingerale and Earl Grey Tea. EGT lasts a surprisingly long time. I wanted to like Paperback, but like CB IHP's In the Library, it did not smell much like books to me. CB must hang out with a lot of smoking readers, as all of his bookish scents have a distinct tobacco note. I'm a fan of Earl Grey Tea and Gingerale, too, especially in room-spray formats. Am amazed that some people seem to find Demeter pick-me-ups don't last long, though. Both Holy Smoke (yep, frankincense and I think myrrh too – certainly something resinous) and Figleaf stick around all day on me. I can even pick up a whiff the next morning. Spot-on description of Thunderstorm, Robin. I think the strength of the metallic note is what differentiates it from Rain, but I'm doing this from memory so I may be wrong. Mind you, at about one-fifth of the price of most of those chi-chi scents, Demeter is definitely a bargain. And every time I read the list of scents I'm entranced all over again. Paperback, you say? Condensed Milk? Humidor? Laundromat? Such great and original ideas. Plus I'm still impressed with the accuracy of Dirt every time I smell it, though I've never been tempted to take a bottle home. EFT sounds like maybe it is close to CB's Russian Caravan Tea, which I love. Going to have to find that Gingerale! Agree, you can't evaluate them like “regular” perfumes. But I really like the line. The price is great, and “weird smells” are so rare in regular perfumery. The lasting power seems to vary quite a bit from scent to scent. Some of them literally don't manage an hour on me. Others are fine. I haven't tried Avignon. But now I feel I should! It is a great church-y incense. Try the whole CdG Incense series! My favorite is a combination of Thunderstorm and Bonfire. I call it Summer Camp. I like Dirt, and have also heard that Thunderstorm is probably their best. Oh, that sounds just perfect! Will have to try it. Dirt is a great scent too, but I do think Thunderstorm is better. My boyfriend has been using Tomato for years. It should be called Tomato Leaf, though, it's purely the green resinous leaf smell of the plant. He also wears Snow, which is similar to Thunderstorm with a different dry down. Snow stays frightening “cold” smelling at first, a real pale blue odor that warms up to a slightly green odor that's nothing like real snow but still pleasant. I love tomato leaf in general, but haven't yet tried Demeter's, will have to find it. Snow is another great scent. Just tried Chris Brosius' Black March which is a more sophtisicated riff on Demeter's Thunderstorm (which I bought before). Drydown is much more subtle – doesn't leave you with an overly metallic scent. You get the complexity of rain on cement and electricity but it's softer which makes it so much more wearable. I ended up using Thunderstorm as a room spray. Black March is definitely a fragrance. I haven't smelled snow, but bought Chris Brosius' Winter 1972 which sounds similar. Pale order that warms to green – definitely. sharp, cold, walking through a fir forest in the snow maybe. It's my December fragance – fabulous. Winter 1972 is another great scent. Keep meaning to review it, but we keep having weirdly warm weather…it will have to wait until we get a good snow, maybe. In reference to your mentioning a comparison between Thunderstorm and Rain, I must say I have Rain and quite enjoy it. The lasting power is AMAZING but the only downside is that it tends to give me a migraine. The smell is EXTREMELY clean and does remind me of rain. What a shame it gives you a migraine! Can you use it as a room spray instead, or does that not help? One of my local grocery stores just started carrying Demeter in their health and beauty section, so I went on a sniffing spree today. Right away I liked Vetiver and Mahogany, although the Vetiver dries down to straight patchouli on me. Amber is nice although very vanillic. Thunderstorm reminds me of Lush’s Breath of God, particularly the earthy, rooty drydown that almost smells like mud. Unlike you, Robin, I actually do smell the cannabis in Cannabis Flower; it’s almost hilariously front-and-center to my nose. Fresh’s Cannabis Santal smells like a ginger cookie compared to Demeter’s interpretation of that wacky herb. I have half a mind to buy a bottle and pass it around amongst my toking friends (I myself rarely partake) for a laugh. Lucky you, I wish I had local access to the line, although it’s so huge now that no store could carry more than a fraction. And hey, for $6, go ahead & buy!